If you’ve ever taken public transportation in a city during rush hour, you’ve probably noticed the soullessness and anonymity that grips people and turns them into waking zombies. They’ll ignore anything, put on headphones, turn away, shuffle on… These non-interactions always make me feel a little lonely, even if I am one of the horde. I am there too with my ever-present phone or book – but I always do a quick scan to see if anyone will smile, make eye contact. It reminds me a bit of the outsider-ness of high school, and it may well be what inspired Jennifer Lynn Barnes’ Nobody – the question ‘What if you were, for all intents and purposes, invisible?’ What if no one noticed or cared? And then… what if that were a sort of superpower? Claire has always been good and sweet, and this summer she is hoping that it will finally make a difference to her parents, or to anyone, really. Nix is a trained killer who has unnatural abilities, nightmares, and anger issues. These two Nobodies have spent their entire lives isolated, suffering in different ways from the fact that they are a type of extremely rare, unnoticeable being. When Nix is dispatched by the Institute to kill Claire, no one is more surprised than he to find that she isn’t what he was led to believe – and that discovery will spark something massive, something that will change Nix and Claire forever. The concept of a Nobody as a non-human entity is intriguing. I assume that most teens have felt like outsiders from time to time (I certainly did), and in a way, this story is based on the same premise, only multiplied by several thousand degrees. Nobody has an appeal that reminds me of the X-Men universe, and the movement, omnipresent danger, romance and teenage assassins all mashed together are almost irresistible. If you can follow the leaps of probability, it’s a thrill ride of read. On the other hand, if you are the sort who likes to sift through the world-building for plausible infrastructure, Nobody may strike some sour notes. The reach of the Society, Nix’s tattoos, insta-like – these inexplicable bits/weaknesses may turn some readers off. I wasn’t bothered until after I’d finished the book, which goes to show that it is possible to finish in one gulp due to spot-on pacing and a take-no-prisoners plot. As for characters, Nix is the broken but honorable killer, and Claire the sheltered, frustrated, quiet one with untapped inner strength. While their maturity might not have been as believable in a contemporary young adult novel, their unique upbringing and Nobody nature allow for some leeway. One of the book’s themes was that there are no blameless adults, and very few (if any) blameless teens. This is an adventure-thriller, but it also takes a hard look human nature, often showing the dark, dangerous side. Barnes’ prose flows between seamlessly between thought, action and speech. It won’t win any awards for beauty, but it accomplishes its purpose: to create an atmosphere full of danger, to make you care for the characters, and to pull the reader along into the conflict of a world other than his/her own. Recommended for: fans of young adult thrillers and dystopian/paranormal fiction, those who enjoyed Neal Schusterman’s Unwind and Kathy Reichs’ Virals, or anyone who imagined Kiersten White’s Paranormalcy a little bit darker and deadlier. 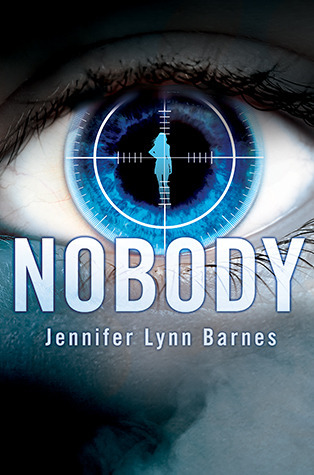 Fine print: I received an ARC of Nobody for review from Egmont USA. This book sounds like it makes the reader think and question, I like that kind of story. Some of the pitfalls you mention, I think I could overlook. I'm going to give this one a try. Thanks for the interesting review. I've been excited about this one because I like Barnes, but I hadn't thought about the premise in that way before. It reminds me of discussing Stephen King's Cell with a friend. He thought the premise was too preposterous and I responded with something like, "Cell phones turning people into zombies? Isn't that just reality?" Reminds me of the "Out of Sight, Out of Mind" episode of Buffy: The Vampire Slayer. What an interesting concept. And I love your personal introduction. I do think it's a little sad/scary how we seek to avoid human interaction these days. I'm so torn over this one! I really enjoyed Barnes' Every Other Day, and your allusions to an X-Men like universe in this one make it sound like the same kind of fast paced, unique, cool plot, but I also hesitate about the insta-like and questionable world building. Chances are, I wouldn't notice till I was done reading either!